Posted by Benjamin Dell on March 3, 2016 . Launching and then running a new startup is immensely fun. Sure it's stressful at times, but primarily it's just damn fun! Iterating on the product, speaking with customers, building a team - what's not to like! There's a danger though; and that's the risk that you're forgetting about the really simple things. The simple things that tell you whether your product is actually being used, or whether new visitors to your site are viewing the pricing page and then signing up. Simple right? But don't let that fool you... It's all too easy to forget to put measures in place so that you have information like this at your fingertips. Measures that equip you with critical, focused and unbiased data that you can then use to steer the business in the right direction, at the right time! There are a number of products out there that can help you gain insights into your SaaS business (ranging from Google Analytics, right through to Mixpanel and Kissmetrics). If you're serious about tracking your key performance indicators (KPI's) and the general health of your SaaS business, then you definitely don't want to be solely relying on Google Analytics. Pairing it with Mixpanel or Kissmetrics is important! In this article, i'm going to run through the 3 things we do to get the most out of Mixpanel. I'm going to touch on each of the metrics / KPI's that we care about (currently), why we feel they are important and why they might be important for your business too. If there's one thing I've learnt, it's that focus is king. Sure, tools like Mixpanel allow you to track pretty much anything (from buttons pressed, to videos watched). Your job as the person responsible for pushing the business forwards though, is to decide what your current focus should be. A startup that launched less than 6 months ago is going to care about different metrics than a larger organisation with 50+ staff would. Decide what is important, as in really important, to your business right now and then work out whether there's a way to get that data and metrics into your lap once a day or week so that you can review their effectiveness and make critical decisions. Updatey, is currently pre Product Market Fit. We're a small company (compared to some of the other Project Management tools out there). Consequently our focus is essentially geared around two areas: Sign-up conversion and user retention. Or in other words; how good are we at convincing new visitors to the site that they should sign-up and once they have signed up, how good are we at keeping them registered? You'll notice that I haven't mentioned anything about driving traffic to our website or acquisition more widely. Sure, i'd love thousands of users to suddenly land on our site; but it's just not a focus of ours at the moment. We want to make sure that our value-proposition is right and that our sign-up process is working before we even think about opening up the gates and letting more people in. Find ways to get data to support your KPI's into your lap on a periodic, and hopefully automatic way so that you can make clear decisions on how to move forwards. Products like Mixpanel can help you in this regard. When someone new lands on our website, we want to be confident that they have understood what our product is about and how we're saying it is going to solve their problems (the value proposition). If we've got it right, we should see a healthy percentage of new visitors signing up. What a 'healthy' percentage looks like for you will depend on a number of factors such as your industry and the size of market (to name but a few). There are of course numerous other factors, but the above are perhaps the most obvious. For further information on exactly how to setup Mixpanel as well as how to send events like the above one to it, check out their documentation. Although we don't really care (yet) about driving massive traffic to our site, we do want to at-least know that when people find us through our blog posts, that they are enjoying what we write about. As such, we also track how many people view blog posts and then sign-up to our weekly newsletter. 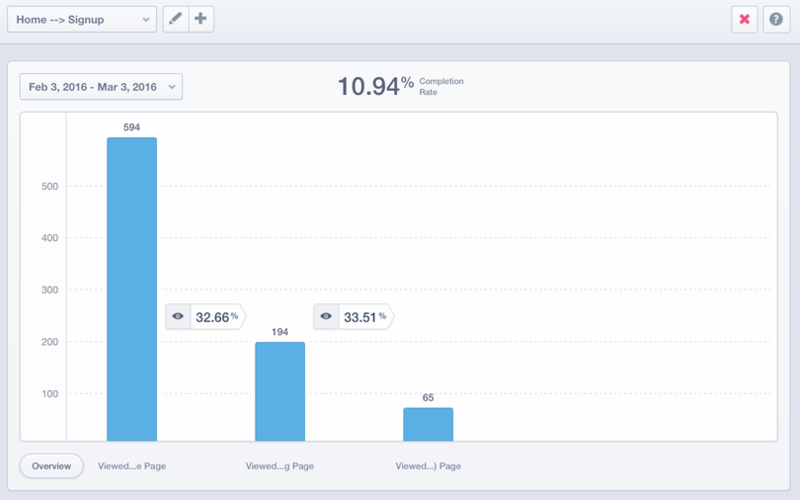 In the same way as we did with metric #1 above, we can send similar events to Mixpanel to track this funnel. In this case, we simply need to track 2 events: 'Viewed blog post page' and 'Subscribed to blog'. Up until now, all Mixpanel events have essentially just been page views. In the case of the 'Subscribed to blog' event, it is more of an activity than a simple page view. We only want to send this event once the user has entered their email address and pressed the submit button. Right, here's where the really serious questions are asked. Imagine 1,000 people view your site. Out of those 100 sign-up. How many do you think will still be with you in 30 days time? How about in 90 days time? If you're not careful, signed-up users will cancel accounts and walk away. This is known as your churn rate and if this is too high... well it doesn't take a genius to understand that no matter how many visitors you get to signup, if too many of them are walking away, then you soon wont have many users at all. Essentially, this is one of the biggest focuses of ours at the moment. 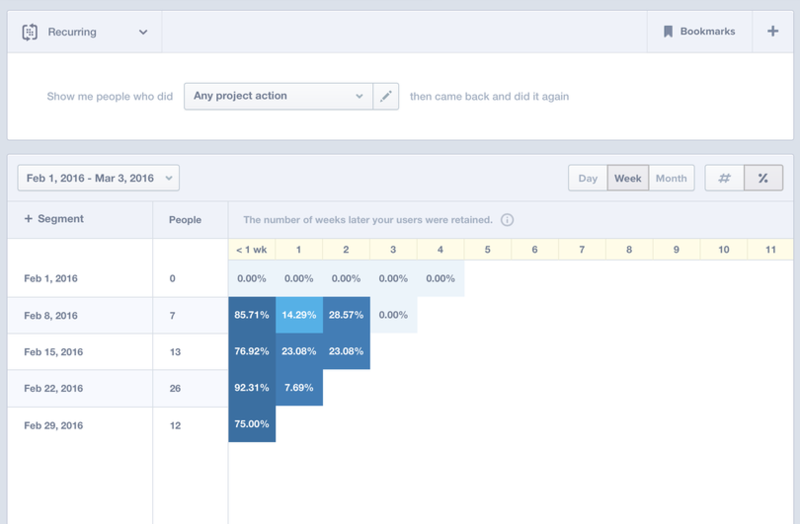 For Mixpanel to track retention properly, you need to decide what action or actions you feel indicate that a user has come back and used your product in a meaningful way. This could simply be that they 'viewed' a page - after all, viewing anything technically means that they have returned to your site. In the case of Updatey we track the top actions you can perform either as an owner of a project or as a participant. For example, this covers actions like adding a task, commenting on a task, inviting a new member, adding a milestone etc. Mixpanel allows us to 'group' these activities together. All other actions (once you're working in a project) are linked to the same "Project action" event. We're simply differentiating them by the 'type' property (which is just a custom property we created in Mixpanel). Doing this allows us to setup our retention report in Mixpanel really easily. All we need to do is tell Mixpanel to consider a user to have 'returned' if they have carried out any 'Project action'. Please note that we (in our infinite wisdom) reset our Mixpanel data a few weeks ago, hence why the above report only goes back a little. What's immediately clear here is that a large percentage of people come back to do something in Updatey within the first week, but this massively drops off in week 2 and week 3. Seeing a report like this should scream out to you that reaching out to new sign-ups (in a meaningful way) in week one is paramount if you want to even stand a chance of retaining them. And that's exactly what we're now doing! Put simply, watch your key metrics like a hawk. 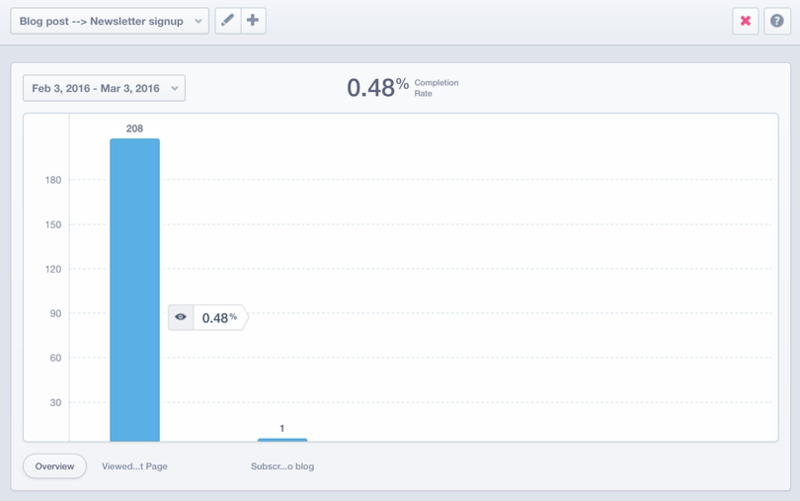 Base your decisions on qualitative data you get from tools like Mixpanel. Only once your satisfied that you've solved a problem (such as user retention) should you allow yourselves to tackle the 'next' problem metric. What are you focusing on at the moment? Have you found any interesting hacks that are helping you either gain meaningful insights into your key metrics, or solving them? Share your thoughts in the comments below. We're also looking for guest blog writers to share their stories here on the Updatey blog. If interested, you can reach out to me at ben@updatey.com. Thanks! It's our mission to measure, iterate and improve... one metric at a time! We're on a journey from zero to $20k in Monthly Recurring Revenue (MRR). You can follow the full story behind our goal to improve Trial to Paid Conversion or head here to see what else we're focusing on.